Buns, Braids and More – 50 Bridal Updos and Flowers that are the Epitome of Elegance! Whether you’re wearing a Gaurang Shah paithani silk saree, a Sabyasachi lehenga or a Manish Malhotra sharara, you can never go wrong with a bridal updo accessorized beautifully with flowers. A bridal updo brings a fuller view of your face and lifts your entire head to bring an exquisite, regal feel. From Helen’s bouffant bun in the 70’s to Alia Bhatts braids today, updos never seem like a bad option, especially for brides. Bridal updos with flowers are so versatile, they hide perfectly behind that sheer crystal scattered dupatta, and even complement strapless ball gowns equally so. While mogra and other white flowers dominate the wedding market, newer trends show us brides opting for brighter colours like pinks, yellows and even orange to make that hairdo pop! 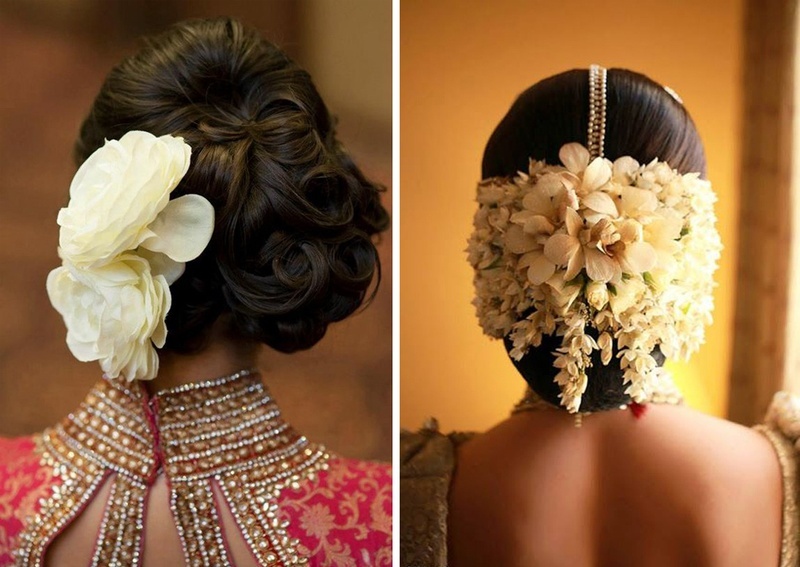 If you’re a bride who likes the classic bun with a mesh of mogra flowers or the contemporary kind who opts for lillies and tube roses – there’s a stunning updo to go with every kind of flower, and every kind of outfit. Don’t believe us? Scroll down to see the montage of photographs handpicked from our Real Weddings gallery for your bridal updo inspiration!